In the fall of 2006, with California’s prisons bulging at the seams and the state facing lawsuits targeting prison overcrowding, Governor Arnold Schwarzenegger used his executive authority to “temporarily house” California prisoners in private correctional facilities in other states. (The Legislature endorsed this policy soon after it was implemented.) Initially, the numbers were small: Within a couple of months of the Governor’s emergency proclamation, just 80 Californians had been sent to prison beyond the state line (to Tennessee). However, California’s use of out-of-state “contract beds” expanded rapidly. By late 2010, more than 10,000 people were serving their California prison sentences outside of the state, including in Mississippi and Oklahoma. Advocates for incarcerated adults criticized the state’s policy, arguing that “transferring prisoners out of state further disrupts ties to family and community.” Concerns were also raised about the conditions in private, for-profit facilities. 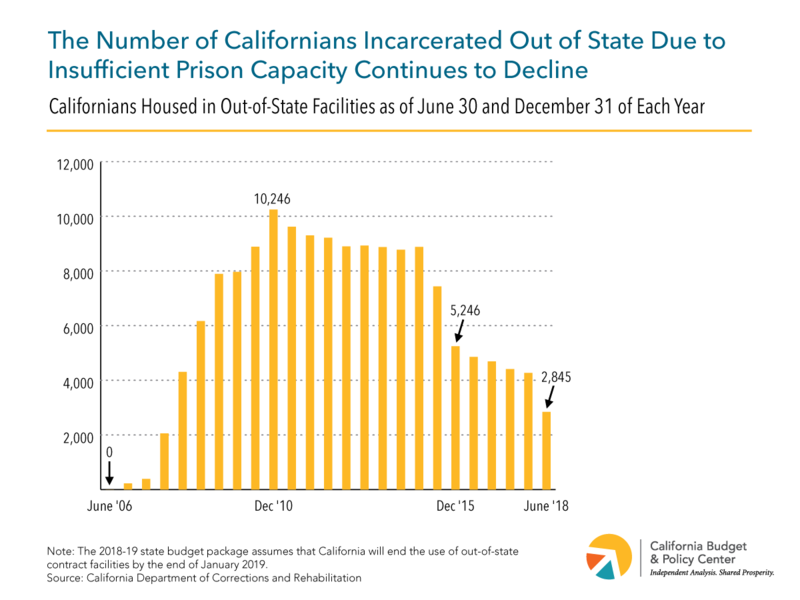 Nonetheless, state policymakers saw the use of out-of-state facilities as a key strategy for addressing severe overcrowding in California’s prisons, at least temporarily. The apparent need for this strategy became all the more urgent when, in August 2009, a panel of federal judges ordered the state to cap its prison population at 137.5% of the prison system’s “design capacity.” At the time of this order — which was upheld by the US Supreme Court — California’s prison population far exceeded the cap. More than 150,000 adults were housed in state prisons that were designed to hold a total of about 80,000 people, putting the prison population at 188% of capacity. Yet, thanks to a series of criminal justice reforms adopted by state policymakers and the voters — reforms that have significantly reduced incarceration — California has been able to comply with the court-ordered prison population cap while simultaneously scaling back its reliance on out-of-state facilities. Since peaking at over 10,000 in the early 2010s, the number of California prisoners housed outside of the state has declined to less than 3,000, as Governor Brown’s administration has pursued a policy (articulated in 2012 and again in 2016) that aims to end the use of contract beds in other states. Now, the culmination of this policy is just around the corner: California is expected to sever its ties with all out-of-state contract facilities by the end of January 2019, ending an era that began a dozen years ago during the depths of California’s prison overcrowding crisis. Does ending the use of out-of-state facilities mean that California’s work is done when it comes to criminal justice reform? Not by a longshot. Although the state continues to comply with the court-ordered prison population cap, the prison system — which is overseen by the California Department of Corrections and Rehabilitation (CDCR) — remains severely overcrowded. Currently, approximately 115,700 adults are incarcerated in 34 state prisons designed to hold about 85,000 people — 136% of capacity. In addition, more than 11,000 adults are housed in other in-state facilities under the CDCR’s jurisdiction, including public and private contract facilities. With incarceration projected to continue declining modestly over the next few years, California should soon be able to scale back the use of private in-state contract facilities — a goal explicitly spelled out in the 2018-19 state budget package — and could be in a position to close at least one state prison. However, downsizing California’s costly prison infrastructure in a bigger way would require additional criminal justice reforms, such as addressing the state’s harsh, one-size-fits-all sentencing laws. By more rapidly reducing incarceration, California could plan for the closure of multiple prisons and reinvest the savings in a range of public services and systems that can help to promote rehabilitation, reduce poverty, and strengthen families and communities. Watch for more Budget Center analysis and commentary on this topic in the coming months.